The pendulum provides opportunities for creativity, design, and analysis. The shape that you choose and the placement of the bolt pattern will determine the natural frequency of the pendulum and the timing of the clock. The upper section of the pendulum contains the pallets that interact with the escapement wheel. These pallets must be drawn exactly as shown for proper operation of the clock. The lower section of the pendulum should be individually designed to reflect your aesthetic creativity, and the timing of the clock. Some examples of different pendulums can be seen from prior student designs. Designs do not have to be symetrical, though large inballances may effect the clock's timing. Bolts must be added to provide the pendulum with sufficient inertia to overcome friction in the mechanism. Review the details of the timing analysis to see how the bolt pattern and the shape of the acrylic affect the timing. Your entire pendulum and escapement wheel must fit onto a 6 x 12 inch piece of acrylic. Since placing the acrylic is not perfect, make sure that you have spacing on all sides of your parts. If your shape can fit into a 5.5" x 11.5" box, it should come out fine. The 0.160in diameter holes are clearance holes for #8 screws. You should use at least 4 bolts centered about 4” or more from the pivot (though not necessarily in a circular pattern). R represents radius and represents diameter. The center distance between each of the 0.16 diameter bolt holes must be at least .4" apart so that the screw heads and nuts do not overlap. A COMMON MISTAKE IS TO PLACE THE HOLES TOO CLOSE TOGETHER. A good way to make sure overlap doesn't occur is by drawing a construction circle with outer diameter= 0.4". This circle represents the nut's full range of rotation. When placing holes, make sure the construction circles do not overlap. Avoid thin sections of acrylic, especially around the pivot point. Acrylic can be very brittle and will break. Follow the dimension suggestions on the figure below. Create two copies of your gear and pendulum AutoCAD file. One for analysis and one for you Lasercamm DMC file. This is the generic pendulum shape and bolt pattern. Students are encouraged to be creative and make their own shape, and will be awarded points for well assembled and creatively designed clocks. Specific drawing instructions are posted below. Step 3: Use the trim tool to trim the pallets. Note: do not draw your your pendulum above the dotted line. Step 4: Draw your pendulum. Be creative! 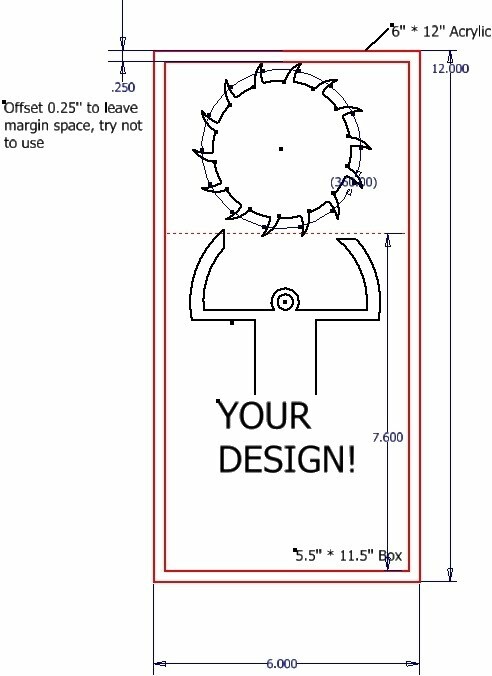 Be sure your escapement wheel and pendulum fit within a 6x12in rectangle. You may want to upload an image and trace it. EXTREMELY IMPORTANT: in order for your sketch to extrude properly, you must have a continuous region. This means that you cannot have any stray lines or lines overlapping. Use Sketch Doctor to help troubleshoot extruding problems. Step 5: to ensure both your pendulum and escapement wheel fit on the sheet of acrylic, I suggest you draw a 8x6in construction rectangle for reference.